The “anchor-line” abdominoplasty includes the median or paramedian supraumbilical scars (either vertical or short horizontal) in the resection and implies extensive abdominal wall excision, by combining vertical and horizontal patterns. A final scar with an “anchor-line” shape is obtained. The authors describe the preoperative patient selection, the vascular anatomy, and the surgical technique. American Society of Plastic Surgeons. 2013 Plastic surgery statistics report. 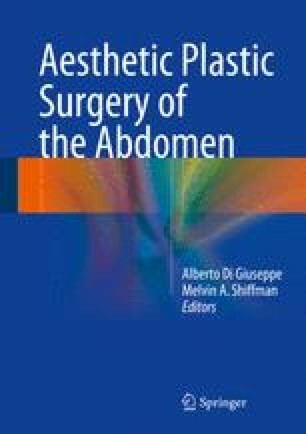 http://www.plasticsurgery.org/Documents/news-resources/statistics/2013-statistics/plastic-surgery-statistics-full-report-2013.pdf. Accessed on 30 Nov 2014.